Fresh produce is rolling into supermarkets and farmer's markets all around the country. June is a fantastic month for healthy eating and these little jewels jumped into my car. Yes, I live near farms. This is a new situation for me because I have lived in cities most of my life. I gave up the city for the country because of many reasons, but one benefit of living here is the proximity to farm stands. I was driving to a dentist appointment because I had to fill a cavity (yes, even Snack Girl gets cavities). And, I saw a chalk sign by the side of the road - RADISHES - it proclaimed. I turned the car around as quickly as I could and purchased this lovely bunch. Fresh radishes, pulled out of the ground that morning, are a delight. I know what you are thinking (radishes, yuck! ), but you have to try them. They are a ZERO food for Weight Watchers (which means you can eat as many as you want). They are also much mellower tasting when they are fresh. Look under the Gifts tab - and for a mere $5 (plus shipping) - you can adorn your vehicle with this catchy phrase I Brake For RADISHES. Everyone in your family is going to want one! I have seen them served with butter and salt (which ruins their low calorie status - but is truly divine). Add them to your salads, lunch boxes, or just cut them up and eat them. I sincerely hope that I have convinced you to give them a try next time you are in the produce aisle! How do you serve radishes? I can hear the crunch. Yum I love that bite, as you call it. If you like them fancy, you can top a cut radish with a small spoonful of creme fraiche and some smoked sea salt -- amazing combination, low in calories, and wonderful for a surprising side dish or appetizer. That is funny! I just bought a bag of radishes yesterday from Walmart - just had a crunch craving! The NY Times recently had a recipe for cooked radishes. I haven't tried them - but if anyone does, let us know! Did you know that for Chinese holistic help, radishes have benefited people with sinus problems? Speaking from experience myself, they really help! I've been quartering my radishes, add some oil, no salt seasoning, then roasting for 25 mins @ 425! They turn out like potatoes. Yum! I definitely heart radishes too. My family always adds them to salads and as kid one of my favorite snacks was a sliced radish with a sprinkling of Lawry's seasoning salt, will definitely have to revisit that! 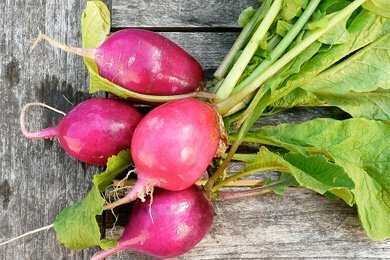 I wanted to chime in with support for the kohlrabi bikerchick mentioned alongside your fresh, crispy radishes. Check out watermelon radishes, too... green on the outside, red on the inside. Very cool. And if you're really hungry, grab a big ol' daikon from the Asian veggie area. I love radishes. My latest way to cook them is - depending on how big they are, cut in halves, thirds, or quarters and nuke them. Top with garlic and pepper. It's like eating potato chunks. I slice my radishes along with some cucumbers and put them in my Japanese pickle press. Each layer is generously salted and the press is screwed down to eliminate the excess water producing a crunchy and delicious veggie. The veggies are washed in fresh water after an hour or two and ready to eat. Radishes will, however, lose their heat or bite. But they are still delicious.